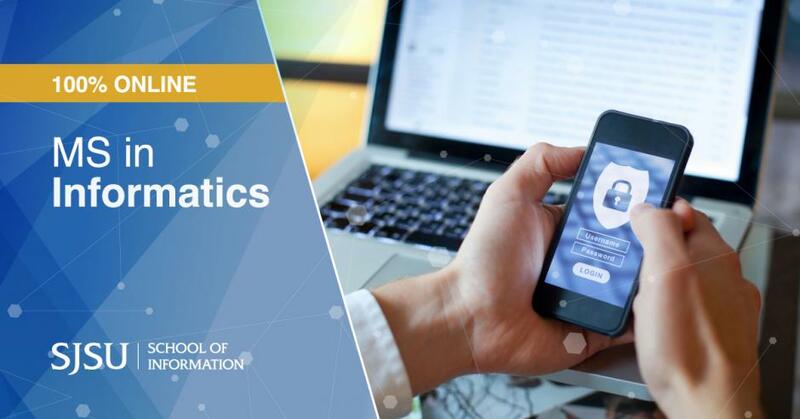 The 100% online MS in Informatics program at San José State University offers a specialized path that focuses on Cybersecurity and Privacy. This exciting new interdisciplinary program provides the skills you need to leverage data and technology to provide information security and assurance. The MS in Informatics program is conducted 100% online and can be finished in as little as one year. Informatics jobs are on the rise as regulatory and business requirements make gathering, managing, and drawing conclusions from specific types of data a strategic imperative. The U.S. Bureau of Labor Statistics reports the median annual wage for computer and information technology occupations was $84,580 in May 2017, which was higher than the median annual wage for all occupations of $37,690. Learn more about a career in informatics. Apply for Admission in Fall 2019! More information on admissions requirements and application process at How to Apply.